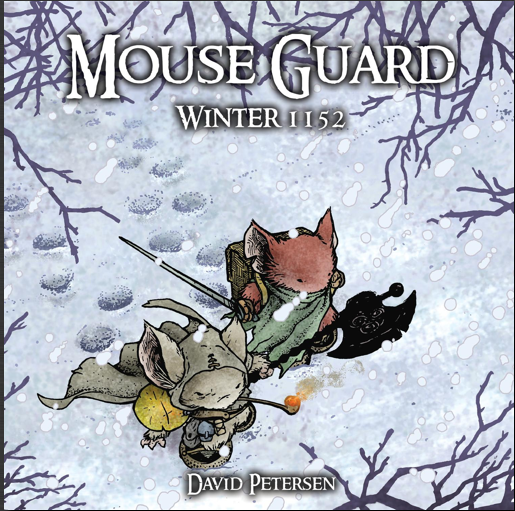 The Mouse Guard has faced one of it’s greatest challenges, treason from within, and managed to survive thanks to the actions of Saxon, Kenize, Lieam, and the other brave mice of the guard…and the Black Axe a lost hero. But a new challenge arises. Winter approaches and the mice are short on supplies. So the four mice plus Sadie, another young guard mouse, head off to other outlaying colonies seeking supplies and calling for a council meeting. Then…disaster falls as the party is making its way home. A hole opens up in the ground and Saxon, Kenize, and Sadie must take an underground route back home through dangerous teritory and Lieam and the Black Axe take the above route, where dangers seen and unseen wait…and death may visit as well. Meanwhile back at the keep treason rears its head again and a guard mouse maybe lost unless the supplies the five are carrying make it back in time. Will they make it in time once more to save the keep? Or will all be lost? The artwork is probably my favorite part of this story. Don’t get me wrong the story is great as well, but the artwork is still stunning. Beautiful watercolor drawings that just capture enough detail in the characters and their surrounding to make them seem real, especially the depiction of the fur of all of the various creatures that appear. In this volume we also have some additional flash back scenes, where the Black Axe–Celanaw, discusses the axe and how he came by it that are done in beautiful pen and ink with a sepia tone. It feels absolutely perfect for the story and provides a nice contrast to the bulk of the story. The one minor issue I do have with the artwork in this volume is where the two mice, Celanaw and Lieam, get caught in the snow storm and start icing up. The ice just doesn’t quite look right to me and instead appears like scales instead of ice clumped fur. But I can’t fault David much for this as it would be difficult to capture this type of feeling effectively in any medium. This is still the type of book that I can just sit down with for hours on end and look at all of the details in the illustrations. This again is a gripping tale and has just the right mix of drama–the supplies being low, the dark tunnel, and the second traitor in the keep–to keep readers interested without being overwhelming with so much going on. David creates a pace to the tale that is pitch perfect, always making you want more. And that subtle tension from the first novel remains and is there at the very beginning of the story and continues to build throughout the book. Even more importantly the characters that we met in the first novel grow. You see them learn things not only about themselves and what they can handle in the face of adversity, but what their comrades can handle as well. This tale is a bit darker and younger readers might be a bit upset about what happens to a couple of the characters, but they should still enjoy it and finding out what happens to their friends from the first volume. This is just a fantastic story and I would recommend it for all ages, because it has a little bit of something for everyone to enjoy. I can’t wait to read the next volume in the series.